Posted by Rikki Davenport, Curator of Education, and Alice Thompson, Visitor Services Associate. Drayton Hall’s Museum Interpretation Department embarked on an exciting educational trip on September 29, 2008 to learn more about the complex process of indigo processing and dyeing. 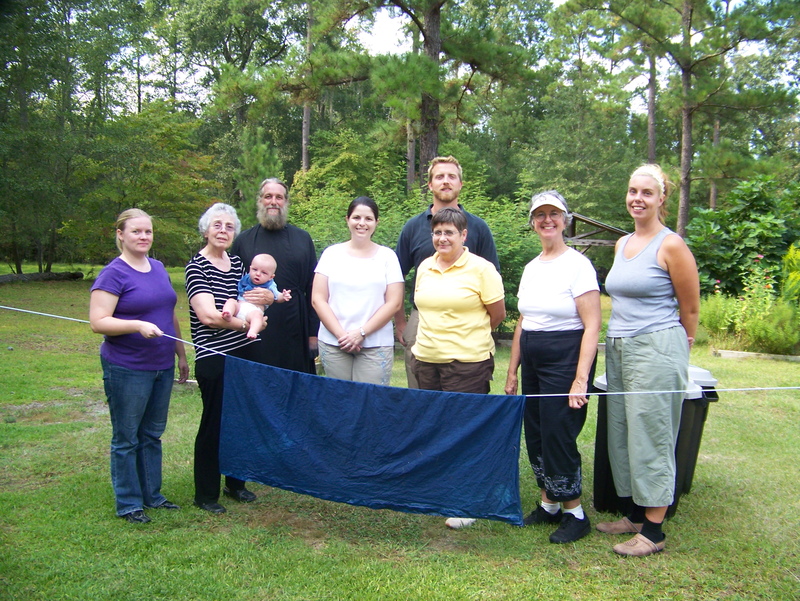 Father John, an Eastern Orthodox monk, kindly opened his Dorchester County home to the Drayton Hall staff to teaching us about the history of growing and processing indigo. He demonstrated one of the many processing methods for the plant: cuttings fermented in warm water overnight until the water and cuttings turned blue and glistened with a coppery film. We plan to use this method with the five indigo plants growing on the porch of our office building at Drayton Hall. Father John directed the mixing of the indigo dye-concentrate solution. Dry indigo pigment and water were placed in a glass bottle and mixed, and then lye was added, causing a heat-generating chemical reaction. Once the lye and indigo combined, a chemical agent was added to remove the oxygen in the solution, making it a dye that would soak into cloth. In this case, thio urea dioxide was added to create what is known as white indigo; historically ammonia or urine was used. John Drayton instructed the use of “puddle water” in the indigo produced at Drayton Hall. After mixing the white indigo concentrate into the dye-bath, Father John demonstrated the dye process. The indigo dye bath smelled similar to hair dye chemicals. Father John slowly added fabric to the bath, careful not to introduce oxygen into the tub. Once the cotton fabric had soaked for twenty minutes, Father John removed the vivid cloth, now a light yellow-green color. As the cloth was exposed to oxygen, it changed to a tie-dyed blue/green, then to a deep blue color. While our fabrics drip-dried, Father John took us on a tour of his gardens, showing us the ten-foot-tall indigo bushes and stubby little madder plants, a plant whose root was historically used to create a red dye. As our short visit with Father John came to a close, we rinsed out our sample fabrics and headed back to Drayton Hall. We plan to incorporate much of this information into our education programs and show our students authentic indigo-dyed cloth. Thank you, Father John, for your hospitality, patience, and instruction, as well as the magnificent lunch! More photos showing the process, and vibrant results, can be seen by clicking here.